The term “iliad” in Greek mean a series of miseries or disastrous events and “Odyssey” meant a long wandering or voyage usually marked by many changes of fortune. Welcome to the Economic Iliad & Odyssey. What we are facing is truly extraordinary. There is absolutely NO economic theory from Adam Smith to Keynes that ever addressed negative interest rates no less sustaining such a trend. 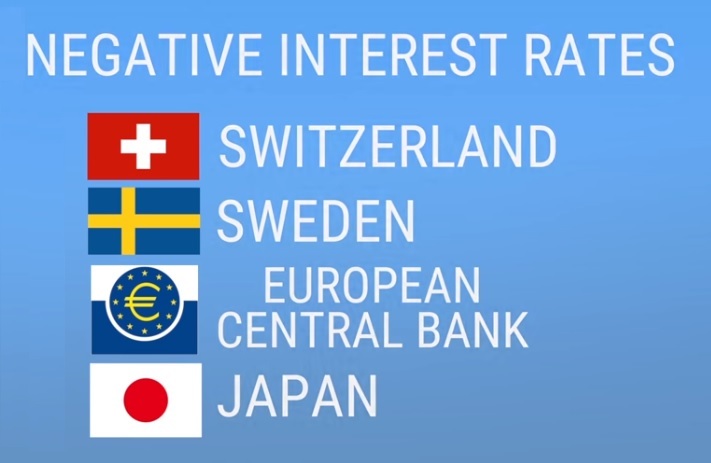 There have been four major players who ventured into the negative interest rates territory but the disasters of this policy in Europe and Japan were implemented in hopes to stimulating the economy. In the case of Switzerland, they were seeking to prevent capital flowing into the Swiss franc as a safe-haven. We are now on the threshold of the most PROFOUND economic event which has never before in history ever taken place. This is where opinion becomes worthless. All we can do is approach this on a collective basis internationally and without bias. COMMENT: I am a senior exec here in the German auto industry. I attended your Berlin conference. I just want to say your ECM is remarkable. Our industry has seen a decline in auto sales since the middle of 2018 right on schedule. It looks like it will be a hard landing here. This Brexit issue has been a major factor in calling into question our faith in government. Then the global warming people have injected demands for new emissions rules which the politicians have introduced. I am not sure this will improve at all when the ECM turns. Those in government are incapable of managing anything. REPLY: Yes. Between Brexit and global warming pushing this Worldwide Harmonized Light Vehicle Test, the German auto industry is poised for a bear market. The latest data states sales for German cars have dropped 7.4%. 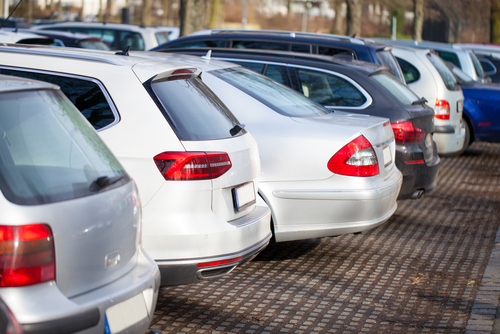 Since the start of September, automakers in the EU markets have only been allowed to sell vehicles that have been certified under the WLTP, with few exceptions. Various brands have had mixed results. Porsche decreased the most, falling 74%, followed by Audi with a 64% drop, while VW brand sales declined by 19%. Since the German auto industry is the backbone of Germany, and Germany is the backbone of the EU, you would think that the politicians might be concerned about what actions they are taking. I suppose this is what being BRAIN DEAD really means. Both the central bank of Japan and of Europe have destroyed their respective bond markets. Looking forward, we are facing a very dark period when it comes to the ability of governments to continue to function. QUESTION: Mr. Armstrong; I assume you read that Mr. Nagai has confirmed what you have been saying that the central banks have destroyed the bond markets. I must confess, his comments have finally struck a vein in our senior management. I have been trying to explain your view to them but nobody wanted to think anything would ever happen. I managed to get a seat in Rome. Does your report cover the prospects of what the future will be shaped by? I do not think people understand the seriousness of what you have been saying. They all watched your interview in one day. That was remarkable. ANSWER: I know. This is a very serious topic. Far beyond what people understand . This is why the capital flows are going crazy pouring out of Europe into US Equities. I do not think people comprehend that we are staring a crisis in the eyes that is so fundamentally changing with regard to how the world monetary system functions, this is why I said bring your thinking caps to Rome. We are stepping into the great financial unknown – we are entering something where no economic theory has ever gone. QUESTION: Will you be covering BREXIT and the May elections since Nigel Farage will be speaking? 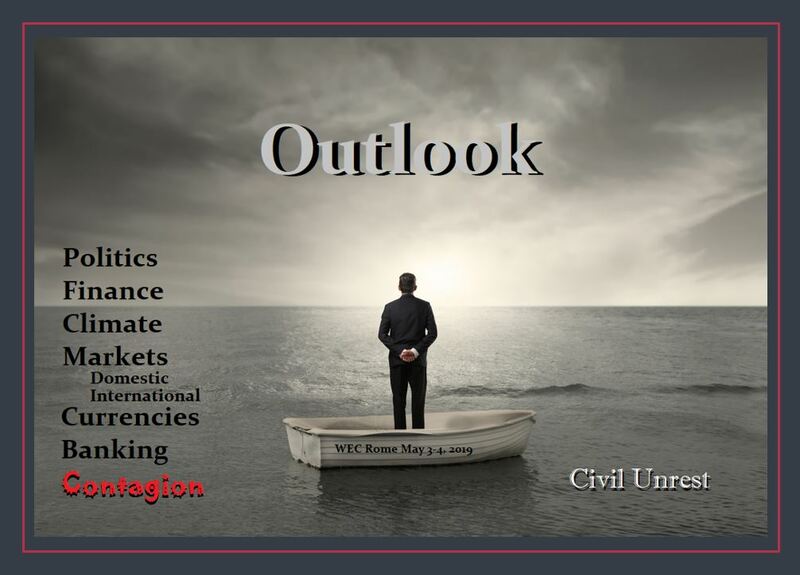 What about your forecasts on civil unrest? It is really starting to surface here in Europe. ANSWER: Yes. Politics is critical because this is reflecting the shifts in confidence that will drive the markets. 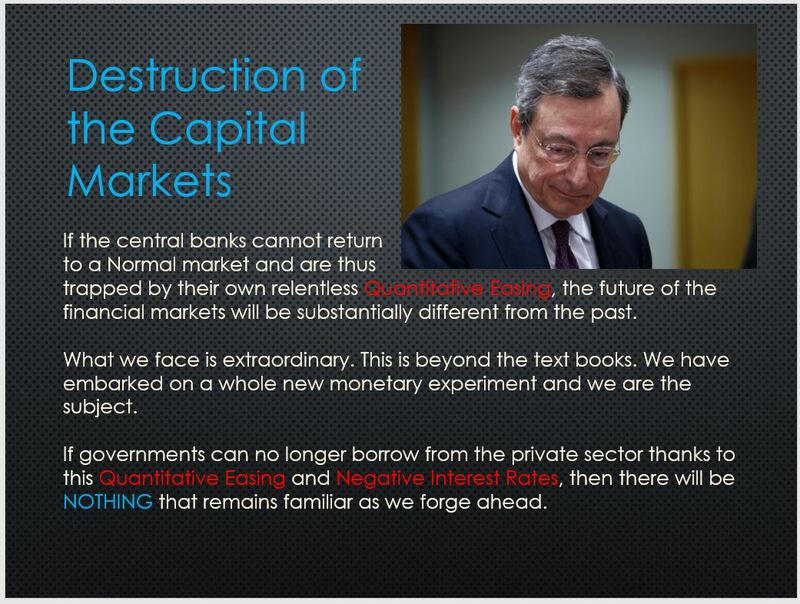 We are facing a major capital movement that will take the form of a contagion. The civil unrest is rising everywhere. The polls in France now show that 80% of the French people support the Yellow Vest movement demanding the resignation of Macrone. We certainly live in interesting times. We will be focusing in on the forecasts the computer has laid out into the next couple of years. QUESTION: Mr. Armstrong; It seems few people even understand that there have been two-tier monetary systems. Do you think this can be a possible tool in the currency crisis you are forecasting for 2021? 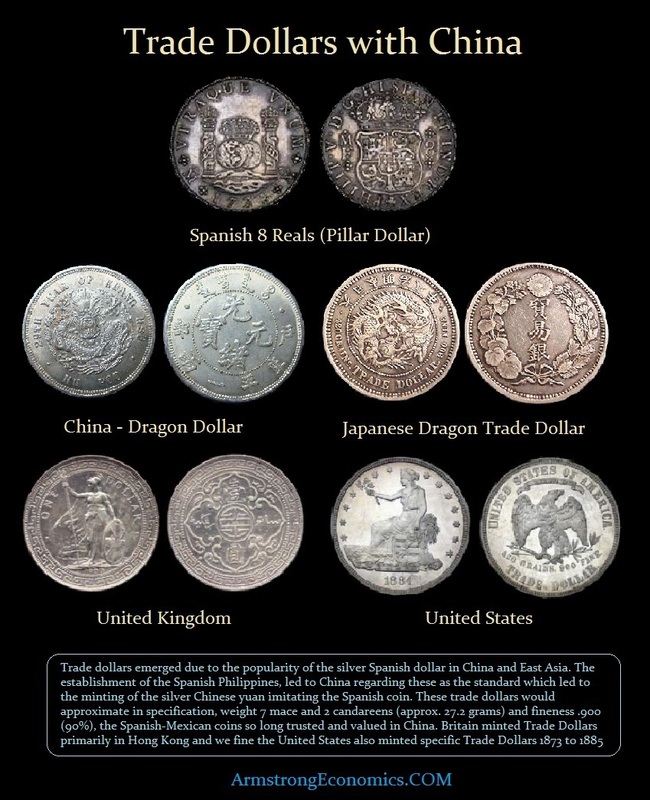 ANSWER: Various countries used to mint trade dollars in silver with different weights for external trade with China. That was a two-tier monetary system for trade during the 19th century. But there have been instances where there were two separate currencies that were also used as capital controls to isolate the domestic economy from the external international capital flows. This was the case with South Africa. An important example of an official deliberate two-tier monetary system is the modern monetary history of South Africa. 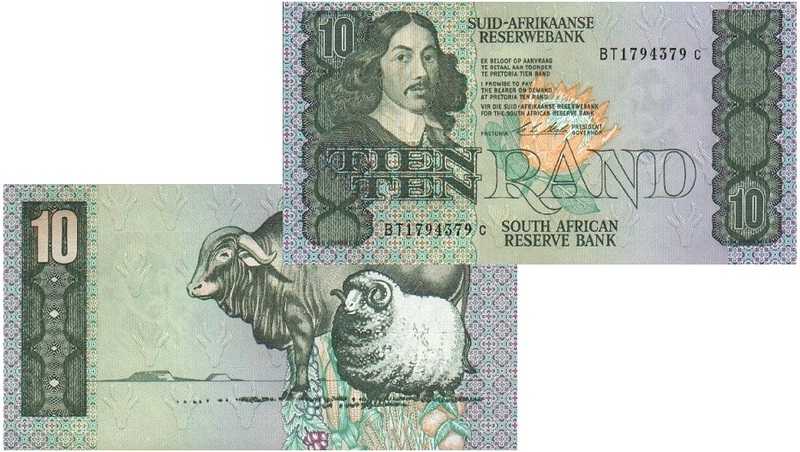 Until the late 1960s, South Africa had a fixed exchange rate for its currency. The rand was pegged to major foreign currencies, as was the case under the Bretton Woods system. It was during 1979 when the South African government switched to a system that formally expressed parity against the dollar. The value of the rand followed changes in the balance of payments and moved roughly with sterling and other weaker currencies until 1985 when the dollar soared and the birth of the Plaza Accord took place. The foreign debt crisis of 1985 caused the rand to depreciate at a spectacular rate and the dollar rose in value. The rand fell to an all-time low of less than 40 cents to the US$. The rand recovered somewhat in 1987, reaching 43 cents, but it declined steadily thereafter into 1998. The rand collapsed to about 26 cents against the US$ in late 1995. Between February 1, 1996 and May 1, 1996, the rand lost roughly 16% of its exchange value, falling from R3.7 to R4.33 = US$1, or a value of about 23 cents to the US$. The government realized that its domestic policy objectives were incompatible with international investment. They then created a parallel currency to act as a two-tier currency unit they named the “Financial Rand.” This hybrid currency was used exclusively for the movement of nonresident capital during the 1980s and early 1990s. The Financial Rand developed out of currency-exchange controls instituted in the early 1960s, known as the “blocked rand.” The Financial Rand was available only to foreigners for investment in South Africa and was created by the sale of nonresidents’ assets in the country. Therefore, South Africa created a formal two-tiered currency system, which insulated the country’s foreign reserves from politically motivated capital flight. Since any divestment by nonresidents was automatically met by new investment, and the price of the Financial Rand varied independently of the commercial rand, a stability was achieved. The Financial Rand invariably stood at a discount to the commercial rand, but the size of the discount depended on South Africa’s relative attraction as an investment destination. The discount stood at almost 40% during most of 1992 during the political crisis. The Convention for a Democratic South Africa (CODESA) began in December 1991 at the Johannesburg World Trade Center, attended by 228 delegates from 19 political parties. Mandela remained a key figure and after de Klerk used the closing speech to condemn the ANC’s violence, he took to the stage to denounce de Klerk as the “head of an illegitimate, discredited minority regime”. This confrontation caused the rand to collapse. CODESA 2 was held in May 1992, at which de Klerk insisted that post-apartheid South Africa must use a federal system with a rotating presidency to ensure the protection of ethnic minorities. Mandela opposed this idea and demanded a unitary system governed by majority rule. Following the Boipatong massacre of ANC activists, Mandela called off all negotiations, and called for a special session of the UN Security Council and proposed that a UN peacekeeping force be stationed in South Africa to prevent “state terrorism.” Calling for domestic mass action, in August the ANC organized the largest-ever strike in South African history, and supporters marched on Pretoria. The rand declined to about 20% by late 1993. Reserve Bank governor Chris Stals, under pressure from the banking and business communities, said that the government would phase out the Financial Rand in 1994 or 1995, assuming that South Africa’s foreign currency reserves reached at least R20 billion and that the discount between the financial and the commercial rends narrowed to about 10%. Foreign currency reserves were low in early 1994 but thanks to a dramatic reversal of the capital outflow in 1993, foreign currency reserves increased throughout 1994 and into early 1995. Finally, by March 1995, with foreign reserves of only about R12 billion, the government abolished the financial rand. The newly unified currency began to trade on international currency markets, marking a vote of confidence in South Africa’s business potential. 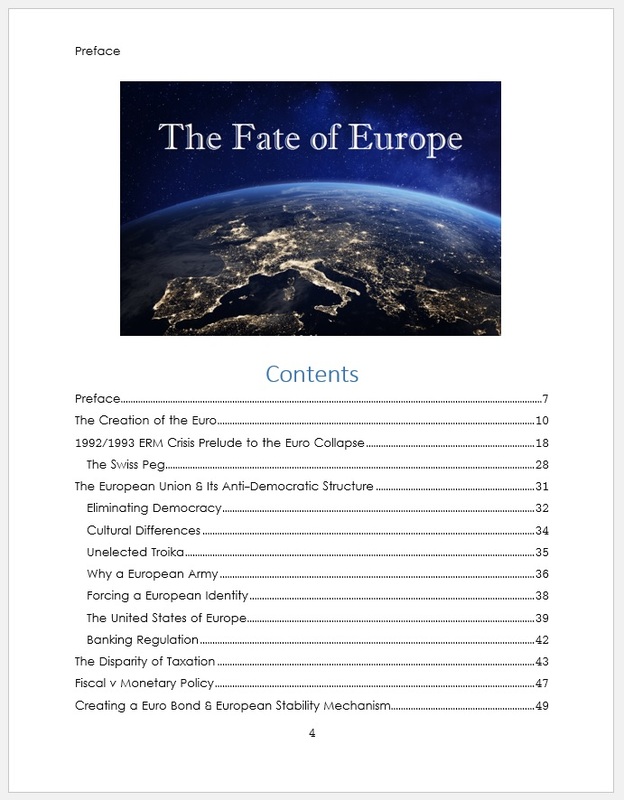 Only a two-tier currency system can possibly weather the economic storm on the horizon from the collapse of the European Union at the hand of this lethal combination of policies. The next banking crisis will most likely begin in the Eurozone due to a continued failure to resolve the systemic weaknesses of its construction. The failure to have consolidated the debts means that the failure on the state level will ripple through the entire European economy. In the United States, state debt is not used for reserves. The failure of California will only send bond seekers into the federal debt who are fleeing state and municipal debt. We see that in Europe as capital fled from most members concentrating in Germany, which is the US Treasury equivalent within the Eurozone. With the first bail-in under the BRRD agreement, the contagion will be devastating as was the case when Michigan closed its banks in 1933 in the USA. The Financial Rand fell below the domestic commercial rand when the 1992 political crisis unfolded, and capital fled South Africa unwilling to invest in a nation that might move into civil war. The two-tier currency system can and does help to distinguish between domestic and international capital flows. There is the potential to create a two-tier monetary system with a new type of international currency that is separate and distinct from that of the domestic currency. This would allow the US dollar to end its reserve status and end the clash between domestic and foreign policy objectives. QUESTION: Marty; Your capital flow models have been remarkable. Do you see Europe as ever getting its act together? We need support to get decisions approved as you know. Will you provide that for us to present to the men above? Nice to see you in Europe. Rome should be great at this time of year. ANSWER: I have covered that is a special report for attendees. It took me a month to write this one. I have tried to cover every aspect so we can deal with the forecasting at the conference rather than all the supportive history. I understand that institutions need the support to justify their decisions. This is the report everyone needs for their files to CYA as the say for decisions. Things look very dicey for Europe and this will be a very interesting WEC. Here is the Index of the Report. I believe this will answer all questions and provide the backup you need to present to any board of directors. QUESTION: Everyone has a chart of the German DAX postwar. I have never seen a chart of the German stock market before the war. Do you have any? ANSWER: Yes. However, you must understand that because the world was on a gold standard, the arbitrage volatility was reflected in the bond and share markets when the currency was fixed. This is why the German share market closed in August 1914, along with just about everyone else. 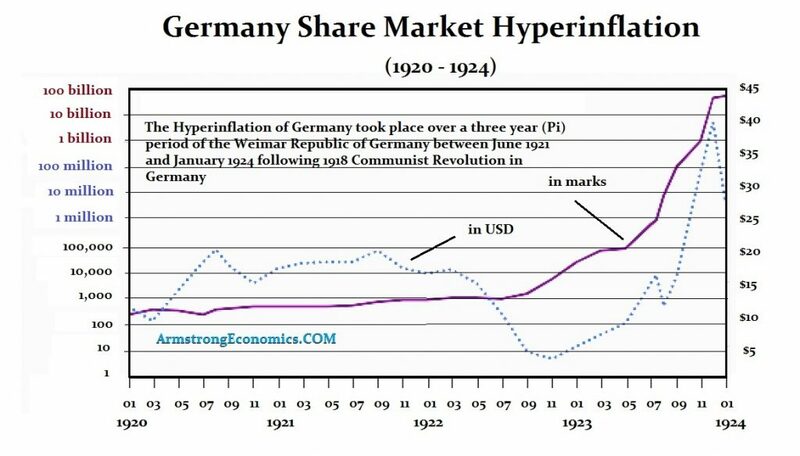 Here is a chart that show the performance of the German share market during the hyperinflation period. We have the DAX also extended back in time. But don’t forget, the DAX is a total return index. If we plot just price, you will see that the German share market looks very much like France. The primary stock exchange in Germany was in Berlin. However, there were 21 exchanges in total. The origins of the Frankfurt Stock Exchange date back to medieval trade fairs during the 11th century. By the 16th century, Frankfurt developed into a wealthy and busy city with an economy based on trade and financial services. Annuities in particular were the hot items back then. It was in 1585 when the bourse was established to trade in fixed currency exchange rates. Currencies actually led to exchanges rather than shares. Eventually, Frankfurt developed into an early share market, competing with London and Paris. Mayer Amschel Rothschild and Max Warburg became very influential in the financial trade of Frankfurt. The Frankfurt Stock Exchange had been a major international center. It was completely wiped out by World War I and its consequences. Back then, foreign shares and bonds traded on cross exchanges since money was fixed. German investors at the start of World War I dumped foreign bonds and shares, fearing that their capital would be restricted or confiscated. This is also why all the exchanges simply closed in Europe. Any capital they managed to free up from the sale of foreign investments was reinvested mostly in German government bonds. They were patriotic and believed in their government. However, by the end of the war, the Frankfurt Stock Exchange lost all foreign securities listings for bonds or shares. Frankfurt lost its standing as an international stock exchange entirely, and that would only begin to resurface in 1949. 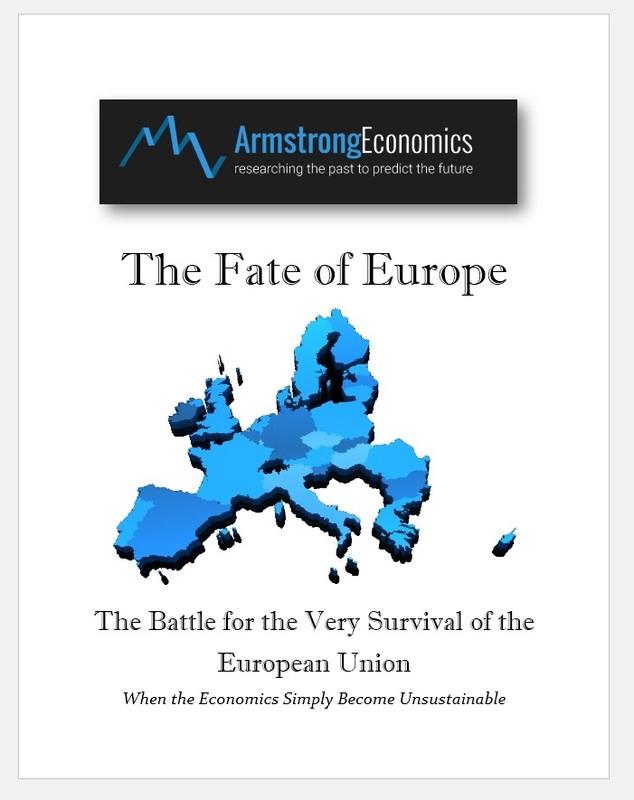 In Europe, the fear of catastrophic declines in stock prices was met with controls at first. Overall, stocks and bonds were not allowed to trade below the price they had been trading at on July 31, 1914. Restrictions were also placed on capital. Money movement was highly restricted to preventing any large outflows of capital, forcing many into black markets. One means was to buy collector stamps and coins. They would then export especially rare stamps and then sell them in America. After two world wars, most of the rare stamps happened to be in America and gradually returned to Europe during the late 1960s. With these restrictions in place, markets reopened in Europe. The London Times began printing stock prices for London and Bordeaux on September 19th and for Paris on December 8, 1914. In January 1915, all shares were allowed to trade on the London Stock Exchange, though with price restrictions. The St. Petersburg exchange reopened in 1917, only to close two months later due to the Russian Revolution. The Berlin Stock Exchange did not reopen until December 1917. 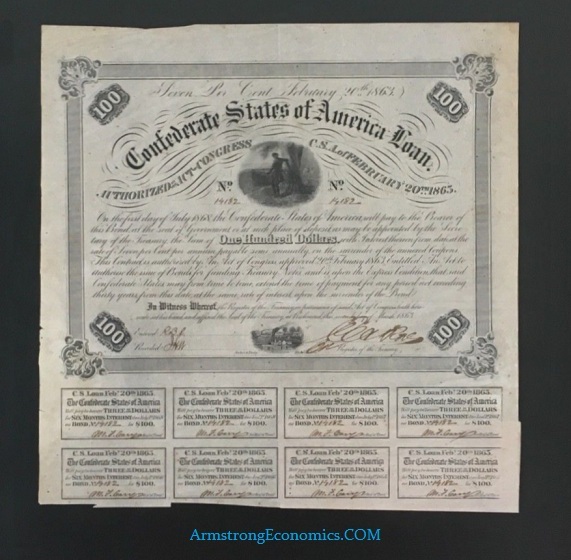 The loss of the war meant those who had invested in German bonds suffered the same fate as those Americans who invested in Confederate bonds. Indeed, to fund World War I, Germany relied more on raising money by selling bonds than imposing taxes. This had the net effect of wiping out the savings of the middle class and upper class. During the hyperinflation going into 1923, the losses in bonds were devastating, but in contrast, equities became a prized object among speculative investors. The Frankfurt stock exchange saw unprecedented losses in the bond markets and shares became the speculation objects that rose sharply going into 1923. The German war costs covered by taxation, including state and federal combined, was only 13.9% which was lower than 18.2% taxation imposed in Great Britain for the war effort. German debt exploded after 1916. That is when the federal government’s short-term floating debt grew relentlessly, and by the end of the war it accounted for nearly one-third of the German national debt. The seriousness of the German debt crisis, which led to the postwar hyperinflation, was the fact that after 1916 German banks began to purchase more of the government’s floating debt. Government debt dominated the market and banks took on more public debt than private. 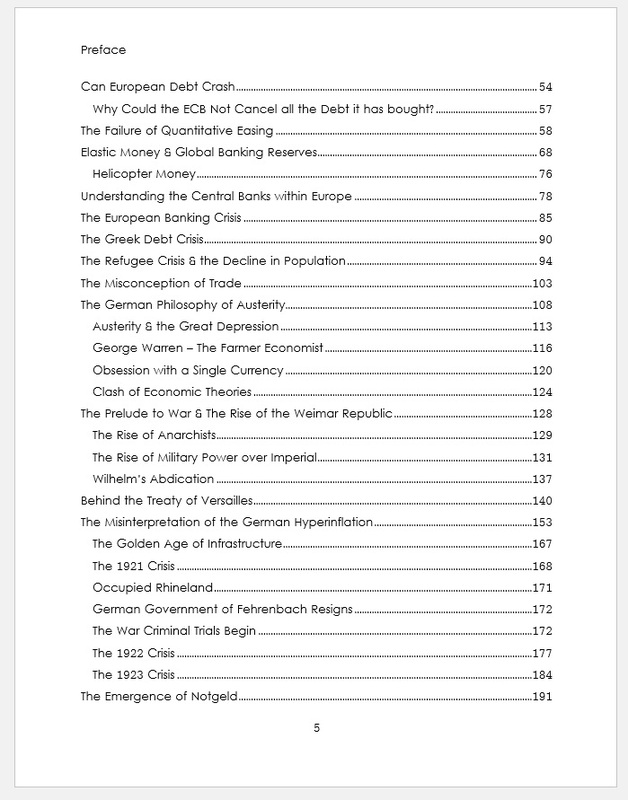 When the public debt was marginalized by hyperinflation, it also wiped out the banking system. By the end of the war, the international contacts of the Frankfurt Stock Exchange had been lost. Inflation set in and reached its first peak in 1923. In October 1929, the Germany stock exchange prices crashed dramatically on the 25th. The world economic crisis ruled the following years. The economy only began to stabilize in 1932. The following year, the Nazis took over and centralized the nation’s economic policy. The Frankfurt Stock Exchange was merged with the Mannheim Stock Exchange and the number of exchanges nationwide was reduced from 21 to nine. Under the stringent Nazi economic regime, free trade was suffocated as Hitler defaulted on external debt. The majority of capital assets was directed to benefit the war economy. 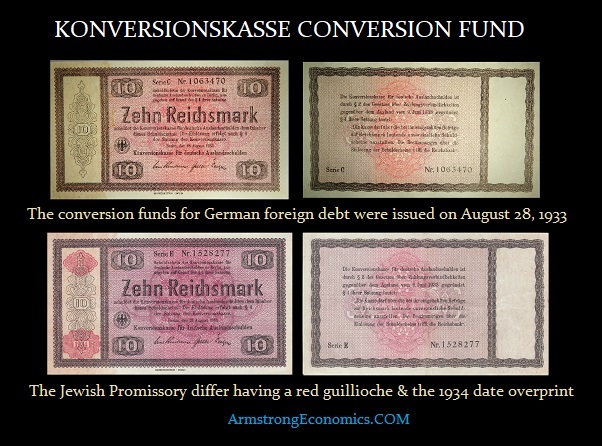 He even issued conversion fund certificates that were exchanged one for one with German marks if you sought to leave the country. This was part of the currency controls but they were worthless once you left the country. I first had the idea of writing a book such as this about ten years ago. It seemed to me that each of us learns something of value as we go through life, but most of us do not succeed in passing along our knowledge to others before we die. This, then, is my attempt to pass on to others what I, over my fifty-odd years, have come to believe are the truths of life and what I believe may be a path into a better future. 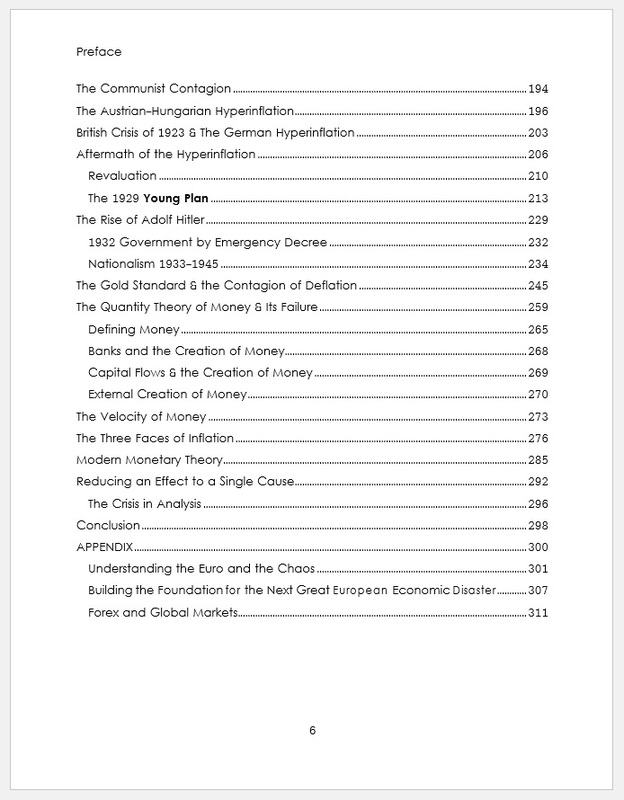 Much of what I write about involves economic issues, since I am an economist by training. Economics, however, is a social science, and my excursions into other areas of the social sciences are therefore not totally out of line. I have had a great deal of “life” experience (both educational and professional) and this book thus covers many subject areas. While analyzing these subjects, I have tried to be logical and objective (as I have tried to be all my life), and hopefully this proclivity is reflected herein. You, the reader, will probably disagree with some or much of what I have written. That’s fine if your disagreement is based on fact; it’s unacceptable, however, if your disagreement is the result of prejudice and preconceived ideas. Throughout this book, I have included editorial writings, which I felt were astute, and which help to illuminate my ideas. In each case, I have credited the author and distinguished his/her writing from my own. Much of what I write about could be construed as anti-religious; it is not. It has not been my intention to support or deny the existence of God or a Supreme Being. A thought that should be kept in mind when reading this book is that virtually nothing we do today is done as it was in the past. By this I mean the “near past”–remember that radio was invented only ninety-nine years ago, and it has been only ninety-one years since the first powered flight. Most of the technology that we now take for granted has been developed in the past fifty years. The corollary to this is that our ideas and attitudes must also be different from those of the past. Try to imagine how people will regard the “absurdly primitive” last decade of the twentieth century in the year 2045 (when all that we know today will have been gone for fifty years). The point is to keep an open mind, don’t pre-judge, and don’t be too certain about anything. We live in a world of fantastic ideas if only we can keep an open mind! It may seem hopeless, but Stephen Green, Bill Whittle and Scott Ott dream of a better life, without the Internal Revenue Service. Imagine there’s no IRS? It would go a long way toward restoring the Constitution in the wake of the devastating 16th Amendment. How then would we pay for all of those reliable and desirable government services?